After historic floods, the clean-up is beginning after evacuations were lifted in Guerneville and both residents and shop owners are beginning are assessing damages. Cheryl Hurd reports. Authorities in Northern California have reopened the roads into two towns cut off for days by a rain-swollen river and residents and work crews have started cleaning up the muck that flooding left behind. The Sonoma County Sheriff's Office said in a statement Friday it lifted evacuation orders issued for about 3,500 people, allowing residents of Guerneville and Monte Rio who left to return home. The statement urges people to be careful because crews are still clearing roads of debris. 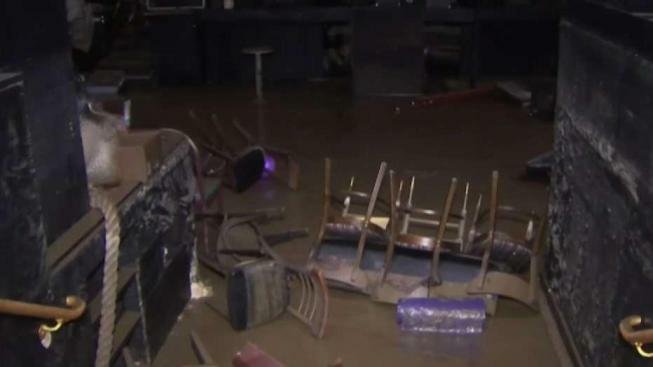 Along the main road in Guerneville, residents and business owners are inspecting muddy restaurants, hardware stores and homes inundated when the Russian River broke its banks Wednesday. On Wednesday, television news footage showed muddy brown water nearly swallowing his ground-level unit and much of the tiny town of Guerneville, part of Sonoma County's famed wine country and a popular tourist destination. Residents awoke Thursday to sunshine and began assessing the damage while the water started receding. Tom Orr, 48, was among those still unable to get into his house after the rain-swollen Russian River reached nearly 46 feet Wednesday night, its highest level in more than 20 years. Lifelong Guerneville resident Cynthia Bush, who lives in an elevated home, was one of the people who decided not to evacuate. "Even in the other floods we stayed here. We pulled our trailer in the backroad and stayed in the trailer," Bush said. "It’s just a river. When you live on a river all your life. You just learn to go with flow," she continued. But some locals and business owners are frustruated by the constant flooding. Michael Hagan, an owner of a Guerneville auto shop, said his business got flood twice in one year. "That means you put all your money from the flood into it and you lose every dime you’ve ever had," Hagan said. "Every business in this town just scratches by anyway. Everybody in this town goes to Santa Rosa to spend their money anyway. How do you recover when people don’t even recognize you’re back in business?" Hagan continued. About 2,000 homes, businesses and other structures were flooded by water up to 8 feet (2.4 meters) deep. About 3,500 people were under evacuation orders. NBC Bay Area's Janelle Wang provides more perspective of how different things look after flooding in Sonoma County.